NETWORK FINALS: 500 QUESTIONS fell 0.1 in final numbers. CABLE HIGHLIGHTS: On Saturday cable, there was the NBA PLAYOFFS game on TNT… and then everything else. TNT scored a huge 4.09 for the night’s Golden State vs. Oklahoma City game, but we already know that the Monday night game (for which final numbers will be available this afternoon) was even bigger. TNT aired a “sneak peak” of sister network TBS’s new WRECKED after 12:30AM and managed 0.84 even at that late hour. 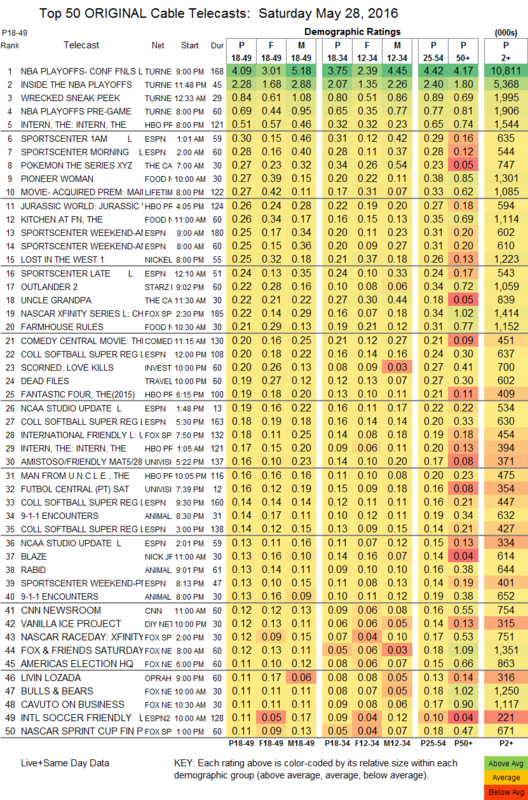 Other sports-related round-ups aside (and HBO’s airing of THE INTERN, since that network continues to list its licensed theatrical movies as “originals”), the next show to hit the Top 10 was a 7AM airing of Cartoon Network’s POKEMON at 0.27. That tied with Food Network’s PIONEER WOMAN, up a tick from last week to 0.27, while KITCHEN AT FN dropped 0.03 to 0.26, and FARMHOUSE RULES was up 0.03 to 0.21. Lifetime’s movie THE MAID was also at 0.27. Adult Swim aired a marathon of SAMURAI CHAMPLOO episodes (since those are always listed as reruns, although we’re told that they’re airing in original versions on Adult Swim, there’s no way to tell if these episodes had aired before), with numbers that ranged from 0.46/1.05M to 0.24/592K. Starz’s OUTLANDER dipped 0.02 to 0.22.